Cremation.org and UrnMall.com are live! The Internet Cremation Society and Urn Mall offer a unique advertising opprotunity for businesses in this niche market. 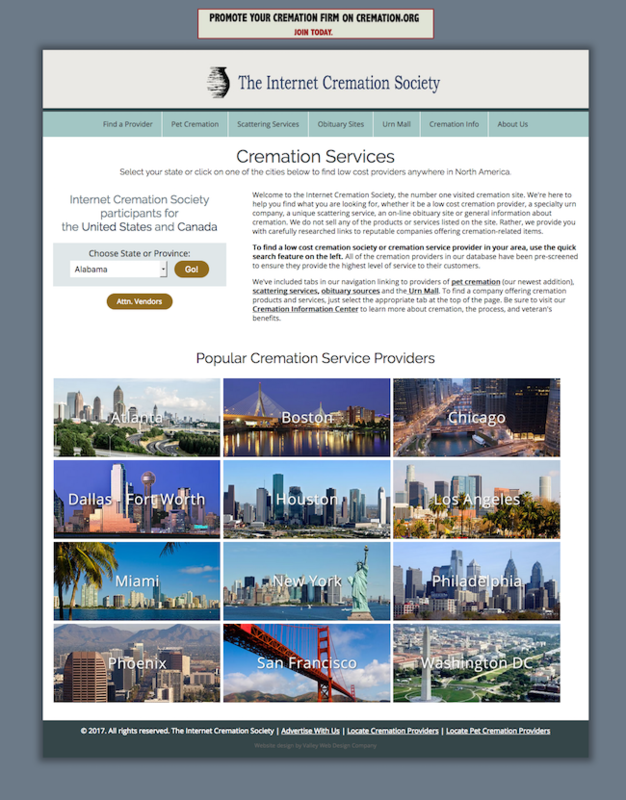 The Cremation.org website is powered by our content management system (CMS) and features a custom programmed service locator drop down box on the homepage. Website visitors can choose a city and state. They are then taken to the service provider’s website, which opens in a new browser window. We also programmed this website with a randomized banner ad at the bottom of every page. eSpark Creative used our CMS to customize the look and feel of the website. The CMS also allowed them to easily upload and resize the images and banner ads in a single step. UrnMall.com uses our content management system to power the Urns for People, Urns for Pets and Memorial pages while blending perfectly with the rest of the website; a testimony to the flexibility of our system! Call us to discuss your goals and your budget and we’ll put together a web design package that delivers what you need in a way you can afford.